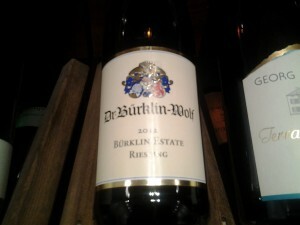 It was a rainy spring evening when I ventured to Appellation Wine and Spirit. It is easily accessible by both the A C E line and the 2 and 3 lines. The neighborhood that it is located in is quaint directed more towards a more ecofriendly crowd, with places like the Cookshop and Highline which is in line with Organic theme of Appellation Wine and Spirit. When I first walked up to the store front, it blended in with the other store fronts which I thought was a disadvantage. However, the name was prominent featured on the building when looking at it from across the street. Where the outside was plain the inside was warm and inviting. The space was open with light color on the wall which gave it an open, airy and fresh appearance. The lighting added a soft glow, eliciting a warm feeling that put me at ease. Upon entering the store, I was immediately welcomed to the establishment. Appellation Wine and Spirit prides themselves on selling a variety of organic wines from producers who deviates from the normal and traditional viniculture practices. 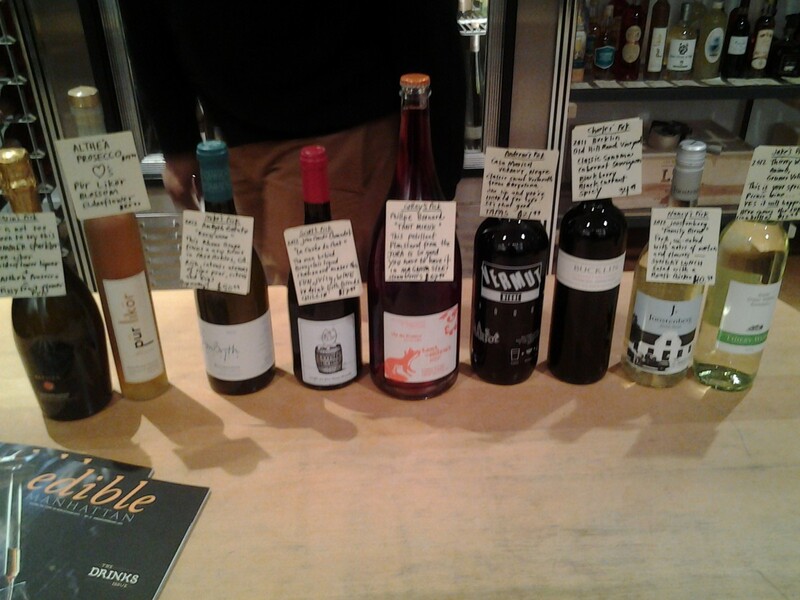 These wines has a more natural flavor and a distinct taste without the added chemicals, according to ales associate Charles who assisted me. 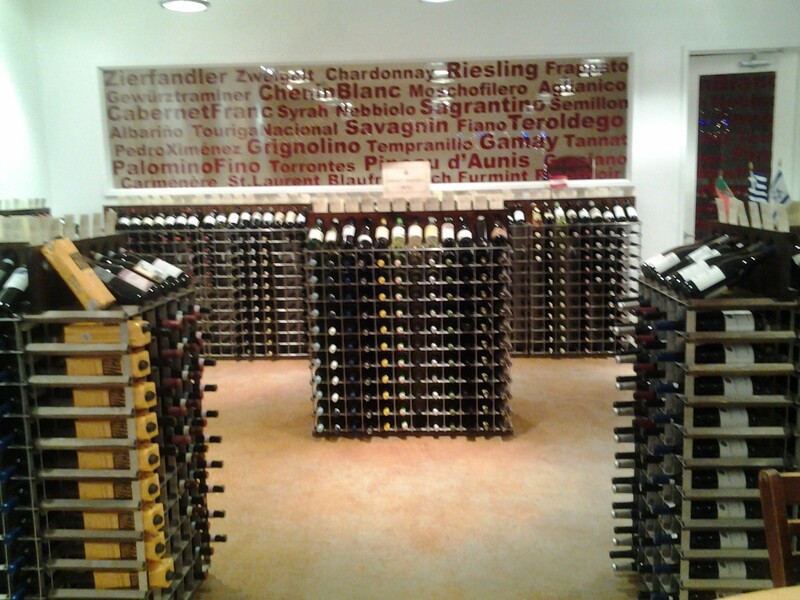 The wide variety can be seen on their shelves, as the wines are displayed by regions; New World and Old World. The regions are then further broken down into light bodied to full bodied. Each bottle accompanied by a brief history about the wine or the producers of the wine. I was fortunate enough that I was able to participate in a spirit tasting event, where I sampled a cognac, a bourbon, and a mescal. This event is one of many tasting event that is held weekly. After doing the tasting I started scanning the store for a while, I was approached by a friendly sales associate that introduced himself as Charles and asked if I needed help. I gladly replied that I was indeed in need of help. I informed him that I was looking for a sweet wine, to which he replied “Sweet as in residual sugar or sweet as in aroma”. From there I was able to explain that I preferred residual sugar and was better able describe what wine specifically I was interested in. Charles was most knowledgeable and was quite helpful. 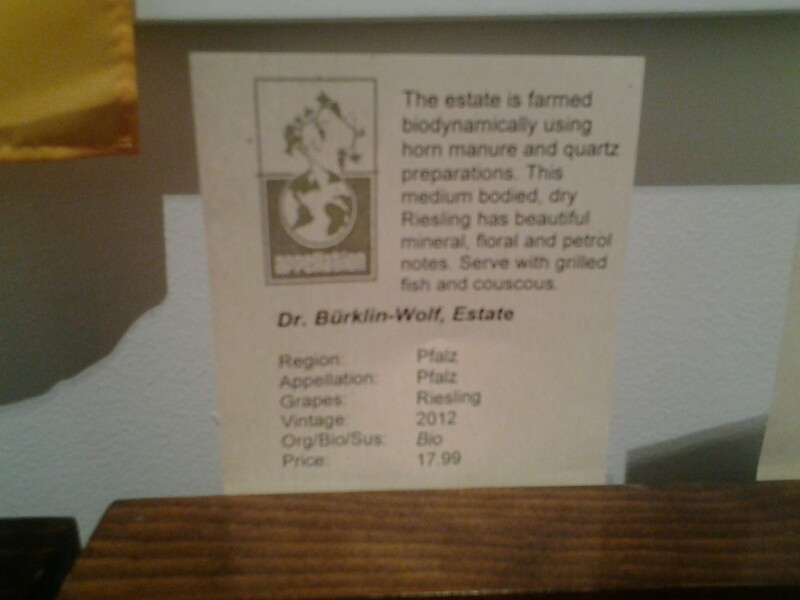 He knew about his wine and was passionate about an it showed as I ended up purchasing two wines a Dr. Bürklin-Wolf Estate Riesling 2012 or $18 and Vittorio Bera & Figli Moscato d’Asti 2012 for 20. The store was a wonderfully experience. 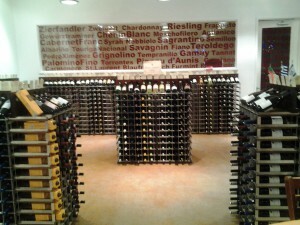 They offered a wide variety of wines from all over the world. The prices range from $8.99- $3000. The workers are friendly and they go above and beyond expectation as they offer a delivery service. Although the store is relatively small, I is still quaint and intimate. There is also an additional room within the store towards the back that is available to host events. I was also interested to know that they have free wine tasting events that are held weekly. 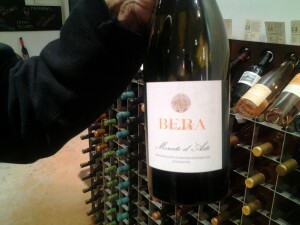 The store also features their wine of the month and wine of the week that is picked by the various employees. These wines are available to be purchased through their wine of the month and wines of the year program for a reasonable fee. They also have a loyalty program as well as a pocket friendly wine rack. The only downside to my visit was that they do not accept Discover cards. His assignment has given me the opportunity to sample wines that I would have normally stayed away from. Appellation Wine and Spirits has made its way on my list of my favorite New York gems. This entry was posted in All About Wine. Bookmark the permalink.